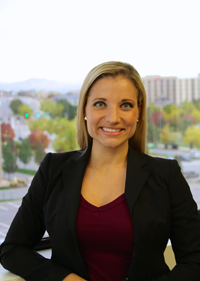 Ashley received her law degree from the University of Denver, Sturm College of Law in May of 2011 and was admitted to the Colorado Bar in October of 2011. Ashley was a judicial intern for Judge Christina Habas, a former shareholder in the firm, a Staff Editor for the Denver Journal of International Law and Policy, Treasurer for the Latino Law Student Association, as well as a member and competitor on the ABA Appellate Trial Team in 2010. She was a recipient of the Robert B. Yegge merit-based scholarship. Ashley graduated with honors from Utah State University with both a Bachelor’s Degree in Political Science, minoring in English, and a Master’s Degree in Political Science. Ashley competed as a Division I gymnast throughout college and was part of a Conference winning team in 2005. As Ashley is a Colorado native, she was eager to move back to Colorado from Utah after completing her studies and athletics. Ashley worked as a law clerk for the firm and was hired as an associate in 2011. In 2015, Ashley became a shareholder in the firm. Her practice includes representing governmental entities in a wide range of matters, defending civil rights claims, bad-faith actions, numerous employment related matters, automobile liability actions, and premises liability actions. Ashley also has a passion for charity work. She serves as a board member for Dollars For Change. It is a non-profit organization dedicated to making a positive and lasting impact on impoverished communities around the world by supporting and implementing development projects unique to a community’s needs. In 2011 Ashley volunteered in Kurland, South Africa, where Dollars for Change was developed. She worked with the village’s youth Social Club and helped prepare local houses for installation of solar water heaters so that families could obtain hot water.